On Monday, August 25th, 2014, the Emmy Awards hosted their 66th annual ceremony celebrating American television at the Nokia Theater in Los Angeles. With Seth Meyers as the night’s host, our TV stars came out and posed on the red carpet, looking more fabulous than ever. 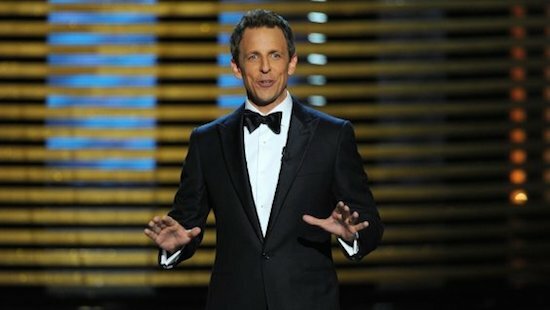 Hilarious, entertaining, and fraught with industry jokes, Meyers made a fetching host. He opened his monologue by explaining that the Emmys were on a Monday night this year because of Sunday night’s MTV Video Music Awards. Pointing out the irony of how MTV still hosts an award show for music videos despite no longer airing them, he took advantage of this to take a jab at how television’s now being broadcasted: “That’s like network TV holding an award show and giving all the awards to cable and Netflix.” With so many worthwhile television shows this year – especially from cable and Netflix -it was a surprise that this year’s ceremony looked awfully similar to last year’s. Breaking Bad still won everything in drama and Modern Family still grabbed a few wins in comedy. Up for six Emmys, the critically acclaimed Breaking Bad, ended its fifth and final season last fall, making this year’s awards ceremony the last time the show would be running in it. The show won its claim as one of the best series in TV history by winning five out of those six nominations; landing its second consecutive win for best drama, lead actor, supporting actor and actress, and writing. “Thank you so much for this wonderful farewell to our show,” creator Vince Gilligan said as he accepted the award. Centered around a high school Chemistry teacher (Bryan Cranston) and his involvement with New Mexico’s thriving meth business, the show also stars 22-year old RJ Mitte as the teacher’s son. The Untitled Magazine’s Indira Cesarine had the fantastic opportunity of interviewing and photographing RJ for our “Legendary” Issue 7. Check out The Untitled Magazine‘s exclusive online interview with RJ here! 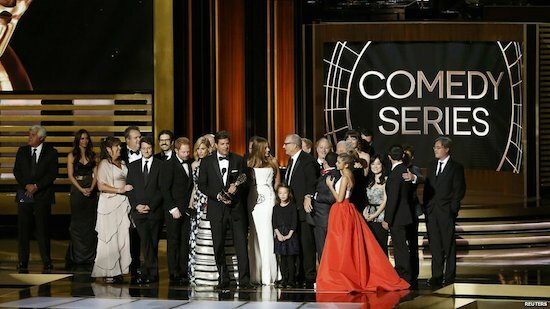 As for comedy, Modern Family won best comedy series for its fifth consecutive year. This leaves the show tied with 90s sitcom Frasier, which had set the record for the most consecutive wins for comedy from 1994-1998. Modern Family‘s Ty Burrell also won supporting actor, while Gail Mancuso won for direction. Other repeat wins include: Jim Parsons of The Big Bang Theory – who will now earn up to $1 million dollars per episode – won lead actor in a comedy series for the fourth time in a row; Julia Louis- Dreyfus, who plays the Vice President on Veep, won her third consecutive Emmy for leading actress in comedy; Allison Janey won her sixth Emmy for best supporting actress in the comedy Mom; and The Amazing Race won its 10th win for reality competition. Overall, the Emmys this year were pretty calm, but no less enjoyable, and it was fantastic farewell to one of TV’s most loved shows in the 21st century, Breaking Bad.